Black Rhinos, also known as Hook-lipped Rhinos are actually grey in colour. Three sub-species are found throughout eastern and southern Africa, although distribution is not what it used to be. The population, which declined by 96% between 1970 and 1992, is critically endangered and at risk from illegal poaching. In 1995 only 2,410 individuals were left, but thanks to conservation efforts the population is starting to recover. Where do black rhinos live? Whilst distribution is not as extensive as it used to be, three sub-species inhabit different areas of eastern and southern Africa, including Kenya, Tanzania, Namibia, South Africa and Zimbabwe. Being vegetarians, Black Rhinos live in areas with ample vegetation and access to water, so savannahs, woodlands, forests and wetlands. What do black rhinos look like? Distinguishable from its relative the White Rhino by lip shape, Black Rhinos have a pointed upper lip that is perfect for grazing vegetation from trees and bushes and two horns on their head, which are made of keratin – the same substance as our hair and nails. They reach approximately 9.8–12.3 ft (3–3.75 m) in length, are 55–71 in (140–180 cm) tall and weigh 1,760–3,090 lb (800–1,400 kg). Rhino skin is thick and layered but sensitive to the African environment and prone to sunburn. What do black rhinos eat? Black Rhinos are herbivores that live on a vegetarian diet of leaves and fruit from trees and bushes. They are grazers, but whilst they have been known to eat up to 220 species of plant, they are selective feeders that tend to go for the best quality food. They like to remain in close proximity to water but can survive for several days without water during droughts or when water supplies are limited. How often do Black Rhinos reproduce? Female Black Rhinos reach sexual maturity around 4–5 years old but have their first calf at around 6.5–7. Males breed later as they need the size and strength to be able to compete with other males; they generally start to claim territories and mate at 10–12 years old. Mating occurs at any time throughout the year and can be violent. Females may not accept the males at first and it is not unusual for fights to break out between the two as the male tries to persuade the female to accept him. Once mated, one calf is born after a 15-month gestation period. Calves can remain with the mother for up to four years but are generally weaned after one. What is the relationship between a Black Rhino and an Oxpecker? Black Rhinos and Oxpecker birds are often seen together and are a great example of a mutualistic relationship, meaning both species benefit from them being together. Black Rhinos are sensitive to ticks, flies and other pests and spend considerable amounts of time and energy trying to free themselves from the itchiness. But, this is where Oxpeckers come in as they feast on pests that have made themselves at home on the Black Rhino – the Black Rhino benefits from pest removal whilst the Oxpecker gets a good meal. Oxpeckers can also act as a warning for the Black Rhino by screeching loudly when danger approaches. Black Rhinos are known to be aggressive and will charge at incoming threats, reaching speeds of 34 mph (55 km per hour). They are generally solitary and spend their time grazing but charge when threatened or panicked. They have bad eyesight so are quick to react and have been known to charge at perceived threats such as trees and other objects within their territory. 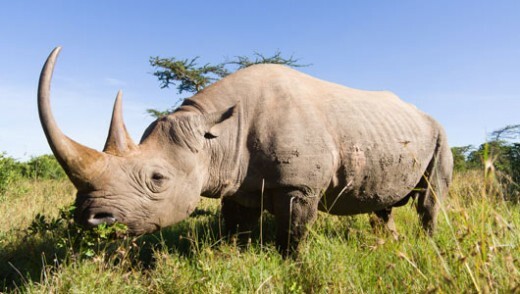 Why are black rhinos endangered? Black Rhino horns are considered medicinal and are used in traditional Chinese medicine. They are also collected as a symbol of wealth and status. Demand is high and as such Black Rhinos have been hunted to near extinction by illegal poachers. Conservation efforts and cracking down on poaching is helping and populations are slowly starting to rise again, but more work needs to be done to ensure the future of Black Rhinos.